June was an excellent month. It kicked off with a little breakfast hamper courtesy of Harrods with some excellent tea and jam that I’m still enjoying. Then an afternoon tea with the girls at The Chesterfield hotel in Mayfair. We also spotted Dale Chihuly’s giant sun sculpture in Berkeley Square. 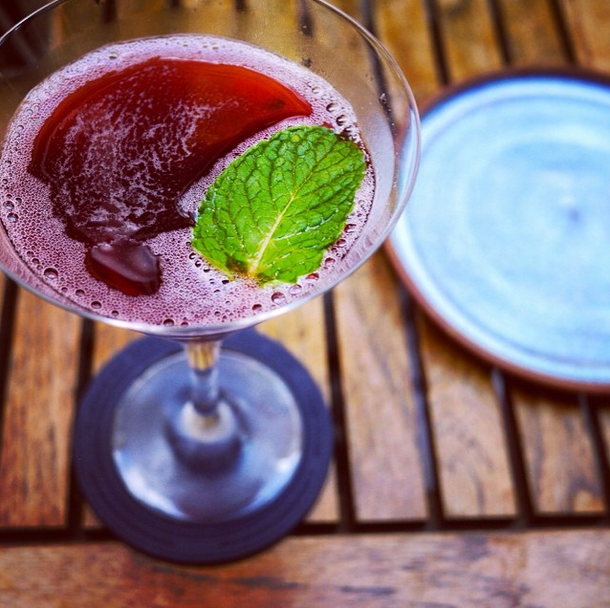 We finished our afternoon with tapas and cocktails at Iberica in Marylebone. I had my hair and make up trials for the wedding, baked some caramel blackberry brownies, went for a food tasting at Bumpkin Chelsea for the wedding party, and ate a Korean meal at Bibimbap in Soho, enjoyed a wander through Mayfair with lunch and cocktails at Mews and went for an 8 hour walk across the city and back again, taking photos around the East End. Then our wedding guests started to arrive. We spent evenings entertaining, going out for nice meals at places like Busaba Eathai and Megans in Chelsea, The Ember Yard in Soho and an afternoon tea in The Drawing Rooms at The Ampersand in South Kensington. We even got a free round of tequila shots at Azteca where we ended our first date. The wedding itself was stunning and then we spent the next two nights at The Ampersand. I don’t have any Instagram photos from the wedding, but will share some of the professional ones when we get them in a few weeks. 1. A Harrods hamper. 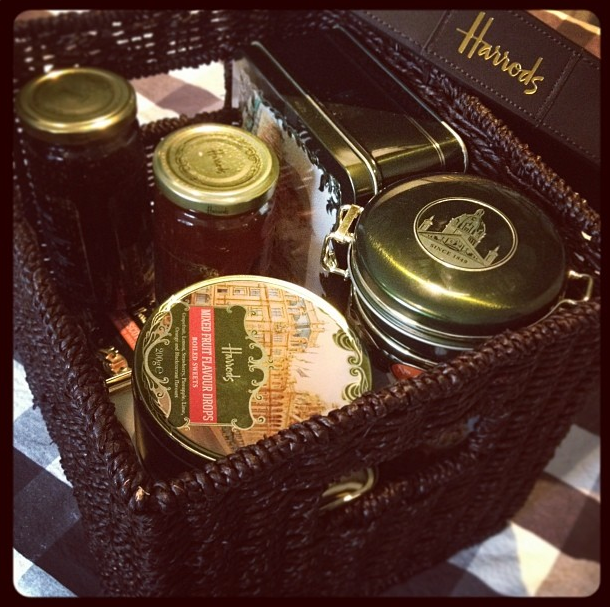 At the beginning of the month, we had a lovely parcel arrive: a luxury breakfast hamper from Harrods full of all sorts of goodies: tea, coffee, shortbread, sweets, jam and marmalade. Harrods always reminds me of my study abroad program because our accommodation (10 years ago now) was right next door and the shop (and its customers) were endlessly fascinating to us. Now, I’m going to make a cup of tea! 2. The Chesterfield. 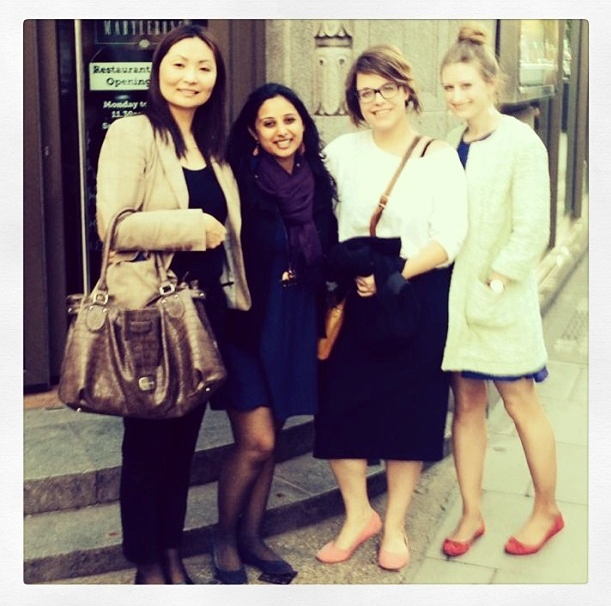 I met Ewelina, Lucy and Dimple for afternoon tea at The Chesterfield in Mayfair. They have a conservatory area that has a bright sun roof and fun decor. 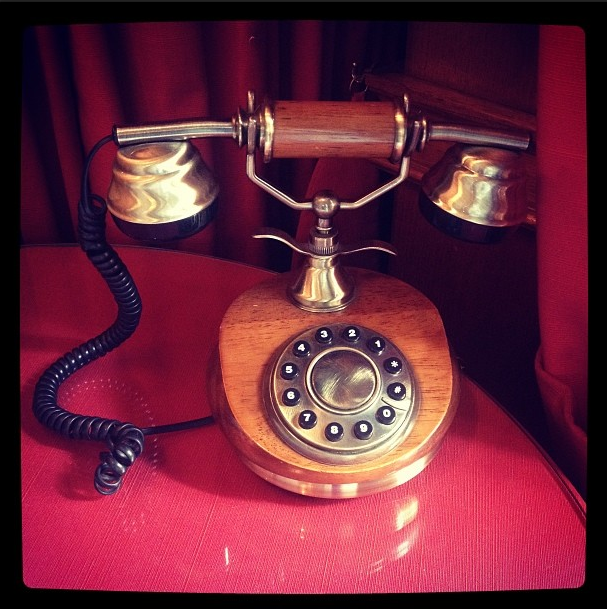 We spotted this old phone in the hotel lobby when we were about to leave and deciding on our next move. I didn’t see the rooms, but I have a feeling it would be an interesting place for a staycation! 3. Confetti. 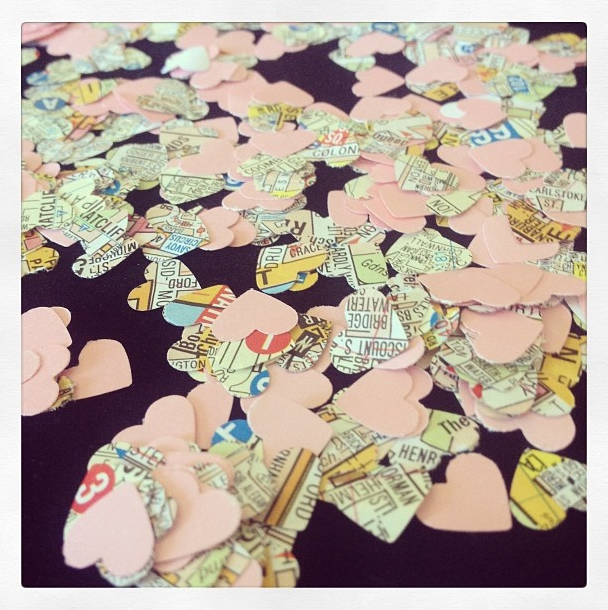 Many lunch breaks and hours after work this week were spent making confetti for our 90 something wedding guests. Dimple helped me punch these out one by one with a scrapbooking heart shaped punch. We went through four or five London A-Zs, half a novel and some pink and red paper. I put them in small brown envelopes that were closed with another heart. The time and effort was worth it when they rained down on us in front of the city hall last weekend. 4. Tapas at Iberica. After our afternoon tea, we met up with another friend, Namuun, and enjoyed some tapas and cocktails at one of my favourite London restaurants – Iberica. I love that in London I have friends from all over the world that bring different perspectives yet in many ways we’re all so similar. Just this group we were American, British, Kenyan, Mongolian and Polish. I don’t even normally think about where we’ve all come from, but every time I do, it just blows my mind. 5. Hair trials. Halfway through the month, I headed over to Hari’s on King’s Road for my trials. I couldn’t find a photo of exactly what I wanted but I explained to Sinan that it should be to the side, messy yet elegant and not too “done”, with a rose or two. It’s such an art and he created my perfect wedding hair in no time. 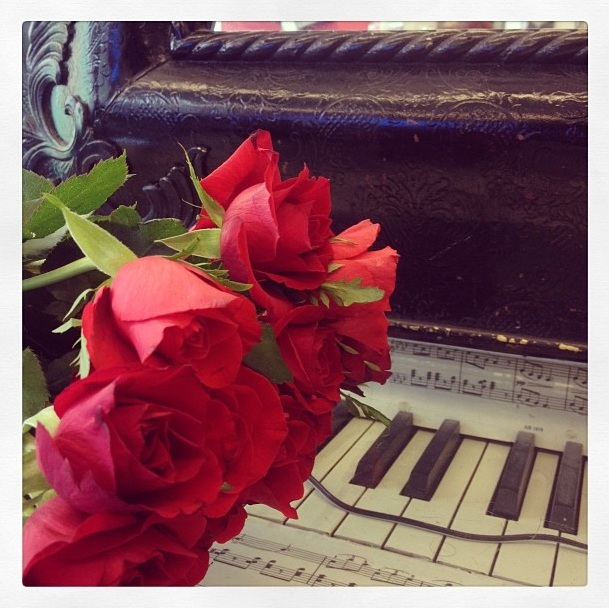 This photo is of a bunch of cheap roses I picked up for the trials on one of the stations in the salon which are all decorated differently. 6. Oakley. Oakley turned five months old on the same day we got married. He’s growing exceptionally quickly. When he’s not tearing through the flat in a whirlwind like the tasmanian devil, he’s a sleepy little kitty. 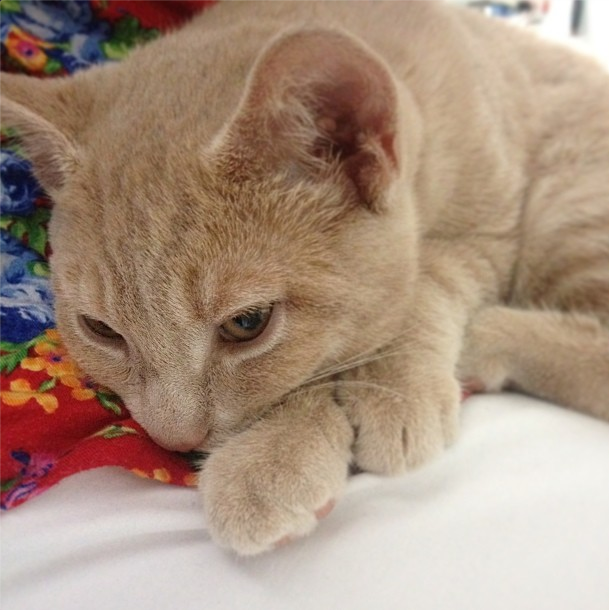 This was him on my lap when I was editing some photos for the blog. In most of the photos I have of him, he’s sleeping because it’s the only time my lens can capture him! 7. 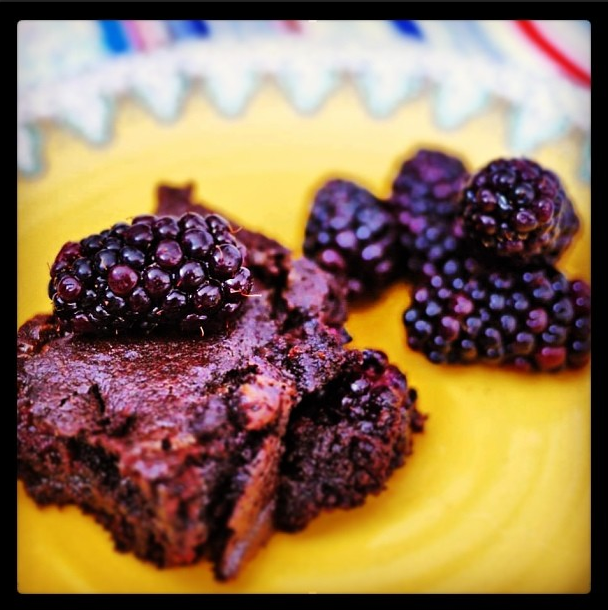 Caramel Blackberry Brownies. I first spotted these beauties on Pinterest and finally got around to making the recipe. They are as delicious as they sound. Gooey, fruity, sweet and a great chocolate fix. I took a batch to work and they disappeared in no time. Plenty more dinner and dessert inspiration hiding in the recipe archives. 8. Fleurs. It’s always nicer to have flowers around whether it’s at home or at work. These little beauties are actually Dimple’s and they’re sitting on the filing cabinets in our shared office. 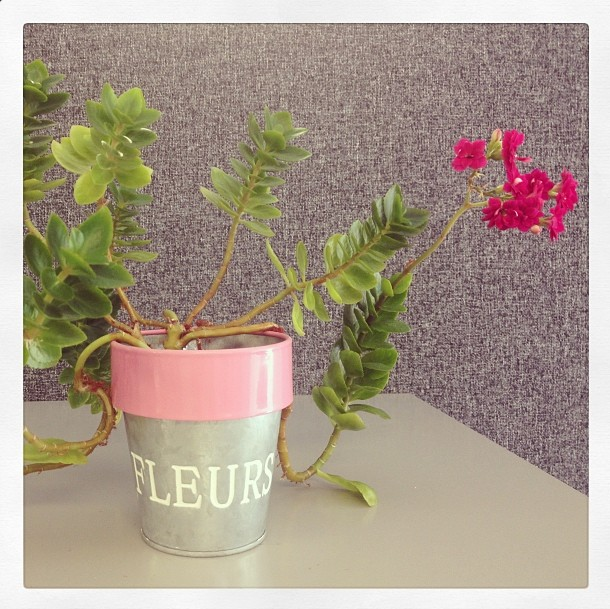 I love the little “French” pot they’re in and they had just blossomed a vibrant pink when I took this photo. I wish I had more light by my desk because it would be full of plants if I did! 9. A British martini. One of my favourite cocktails these days is Bumpkin’s British martini. It’s sweet, fruity and smells slightly like mint. I ordered one earlier this month when we were sitting in the garden surrounded by pretty plants for our menu tasting. It’s the only cocktail I drank on our wedding day. I was also a fan of that little blue plate next to the glass in this photo! 10. 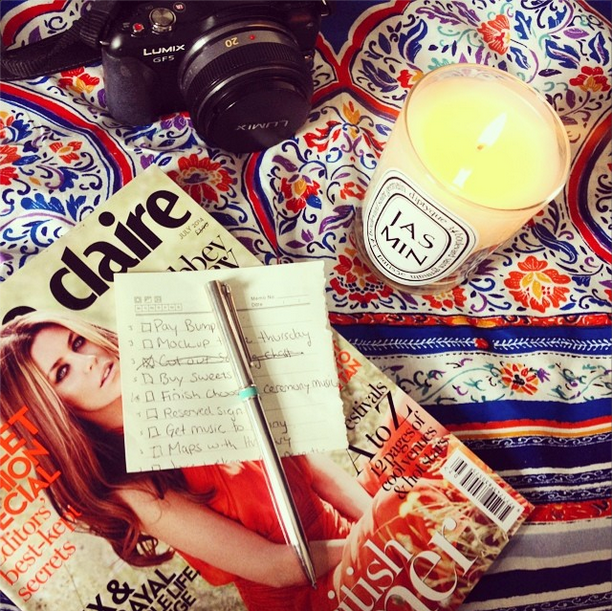 The to-do list. I’m pleased to announce that this little list that has been haunting us for months is now in the bin, full of tick marks. I love a list and make them constantly, but this one has been hanging out on our kitchen table far too long. Thanks to the list though, we didn’t leave anything out, finished all of our wedding preparations on top and all went well. 11. 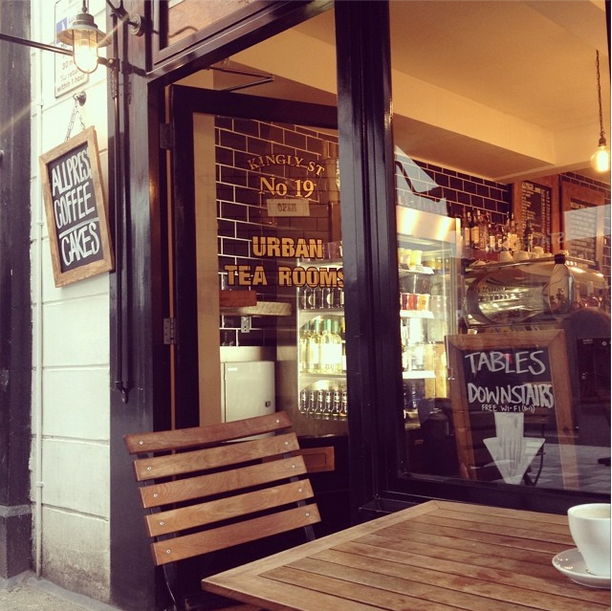 Urban Tea Rooms. One day in June, I had a day to myself on which I spent eight hour walking and taking photos. I walked from Chelsea all the way to Shoreditch, all over the East End and back again with a stop off in Central London for a scone with strawberry jam, cream and a cup of tea at The Urban Tea Rooms on Kingly Street between Regent Street and Carnaby Street. 12. Wakey Wakey. 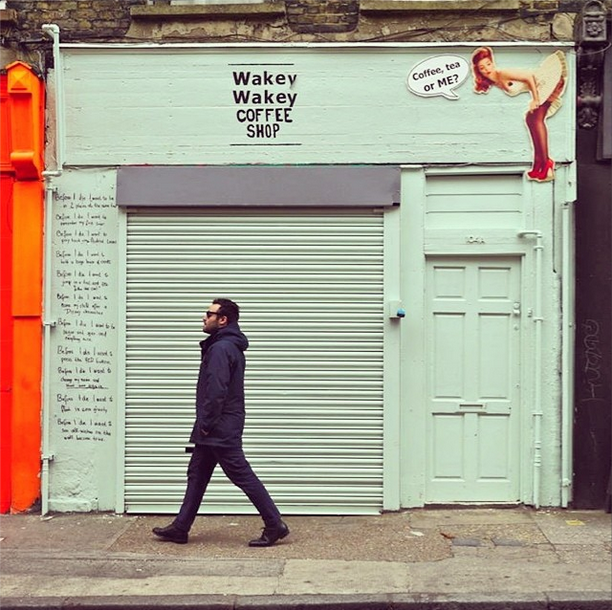 The same day as my visit to the Urban Tea Rooms I stumbled upon this little curiosity – the Wakey Wakey Coffee Shop – which unfortunately wasn’t open or else I would have popped in. If the outside is this fabulous, imagine the interior. If you’re in the area – Sclater Street – and happen to stop by, let me know if it’s as interesting as I imagine! I see they just joined Facebook last week. 13. 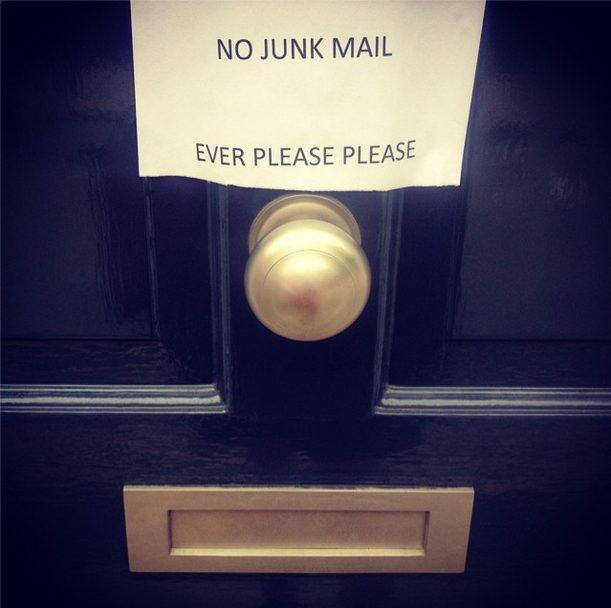 No Junk Mail. Just around the corner, on Pond Place (great name for a street, no? ), SW3, I spotted this sign while walking home with my mom. I love that London is full of quirky, eccentric people and the person who wrote this surely must be one of them. Instead of a simple “No Junk Mail”, they’ve added “Ever Please Please” for emphasis. 14. Breakfast. After our wedding, we spent a few nights at The Ampersand hotel in South Kensington. They have a restaurant called Apero in the basement and we ate brunch there the following day. 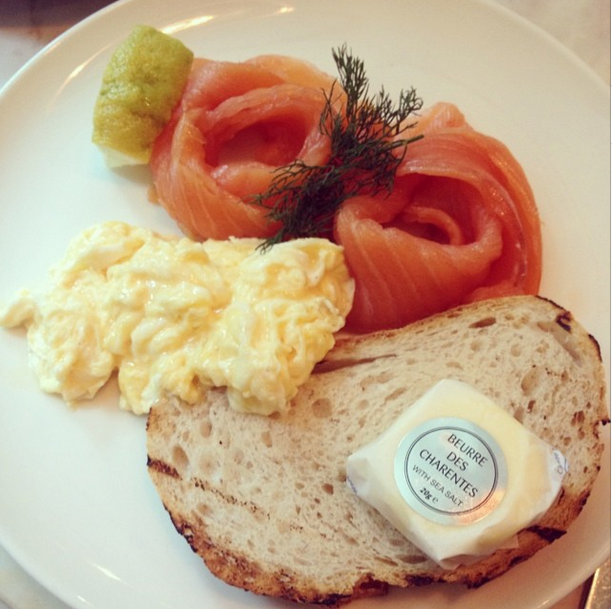 These scrambled eggs with smoked salmon and toasted sourdough bread were just what I needed for a pick me up. Over brunch, we read through all of our lovely cards from our guests!